The nosecone of a Concorde airplane fetched US$490,000 at an Air France SA auction of the supersonic’s parts in Paris. The 4m cone, which brought the highest price at the auction, had a pre-sale estimate of US$12,000 to US$17,000, according to Christie’s International Plc’s catalog. Most of the parts sold for several times their estimates as 1,300 bidders spread across three rooms aimed to take home a piece of the aircraft. The identity of the winning bidder for the nosecone wasn’t immediately available. British Airways Plc, Europe’s largest airline, and Air France, the second biggest, stopped Concorde flights as passenger traffic fell and costs rose. The plane burned twice as much fuel as a Boeing 747. Leborgne, who took more than 400 trips on Concorde, making him the most frequent flyer on the Air France plane, bought several gauges and paid US$94,000 for the in-cabin speed indicator that would flash the Mach 2.02 cruising velocity. 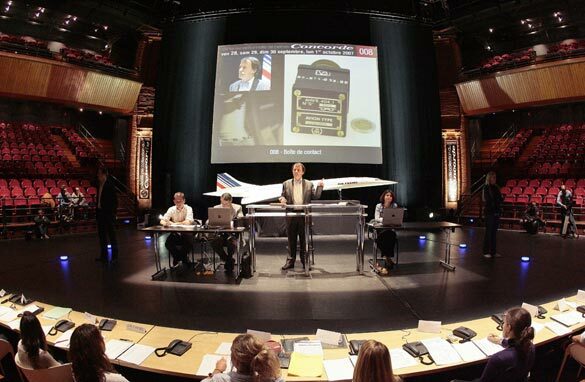 “I’m very happy to see the success this sale has had with the public and I think we will always remember the Concorde,” said Air France Chief Executive Jean-Cyril Spinetta, seated in the front row of the main auction room. Funds raised from the auction are earmarked for the Air France Foundation, which provides grants to schools and hospitals, and supports projects aimed at helping child victims of conflict, illness and poverty. British Airways will hold an auction of Concorde memorabilia on Dec. 1, to be conducted by Bonhams, the London-based auction house. Buyers will be able to view the rival nose cone and cutlery there beginning Nov. 29. At Air France, Concorde operations resulted in a loss of 50 million euros (US$59 million) in the year to March 31, the company said in April. British Airways took a charge of ?84 million to write off costs relating to the retirement. For pilots, engineers and aviation fans, the airplane’s appeal is untainted by commercial difficulties. “It is a legend, fabulous,” said Thierry Morin, chief executive of Valeo SA, Europe’s largest publicly traded car-parts maker, speaking at a cocktail party Thursday where bidders examined the lots. Former US astronaut Edwin “Buzz” Aldrin, who was the second man to walk on the moon, said Concorde takeoffs were in some ways “more dramatic” than a rocket lift-off. “A rocket, since it is vertical, starts off very slowly. The Concorde accelerates hard from the start and keeps it up even after takeoff,” he said at the party. The Olympus 593 engines that provided the plane’s thrust drew less enthusiasm at the auction, with the first motor selling for $153,000, higher than the catalog price estimate of $70,000 to $140,000. The charity sale of British Airways Concorde parts reached suitably stratospheric heights yesterday when a businessman paid £320,000 for one of its nose cones. The bid was the highlight of an auction of more than 120 spare parts and decommissioned items in Olympia, west London. It was paid by Hungarian-born Ferenc Gaspar, 45, from New York, and sent the total proceeds way past what auctioneers Bonhams anticipated. The final figure reached £763,700, with £500,000 going to Get Kids Going!, a charity that gives disabled children and young people the chance to play sport, and the rest to charities nominated by BA. It was Mr Gaspar who got the bidding going by landing the first lot – £10,000 for a display unit that showed Concorde’s speed – and he said later that the nose cone was a bargain. “I don’t think I have paid a lot. I think it’s very cheap. I expected to pay as much as £1 million or more,” he said. He was then pictured with three wheelchair-bound youngsters. Some engine parts went for about 40 times what was expected, with a single turbine blade, expected to fetch £50, selling for £2,000. A grey wool Concorde blanket went under the hammer for £1,200 after being expected to raise only £60. Her hopes of buying a second pair were foiled when she was outbid at £10,000. Many people who had flown in Concorde were at Olympia hoping to take home a souvenir. Among them were Jo Applewhite, 31, a BA stewardess, and her husband, Martin, 39, who had travelled from Newark, Notts. The couple were sad that Concorde was no longer flying and hoped to bid for one of the cabin crew seats. Mr Brooks said he was pleased that the price paid for the nose cone exceeded that raised by the Air France Concorde auction in Paris last month, when one went under the hammer for about £290,000. 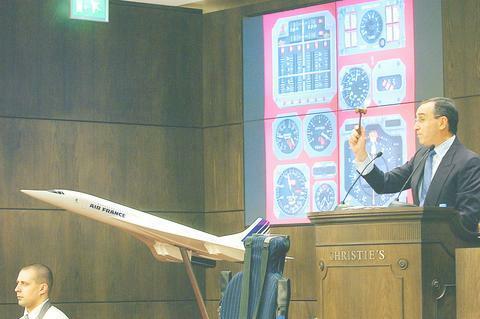 Mike Bannister, the Concorde chief pilot, was at the auction and said the amount raised was “just fantastic”.